From the small scale figures of JLU, I'm moving on tonight to something right on the other end - that being the Marvel Universe Galactus figure from Hasbro, which is currently consuming the universe that is my toy display room! This is the SDCC Exclusive version, not the current release that comes with Silver Surfer, and it has quite a story to its purchase and arrival before I even get to looking at the figure! 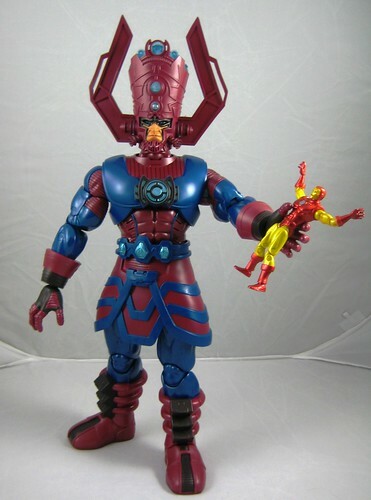 I was quite happy to wait for the eventual retail release of this and work out how to get it to Oz, but then I saw one of the SDCC versions unnoticed and unloved on eBay with very reasonable international shipping, and I certainly wasn't about to displease the devourer of worlds by allowing him to go unsold! I was pretty happy with my find, but it was too early to celebrate. The seller contacted me a few days later to say he wasn't sure he could get the large box the exclusive came in through the post due to its height, but would try to work it out. I have to give full credit to this fantastic seller - he really tried hard to make it work and stick to the price he had quoted. In the end Galactus made his way to our shores with the SDCC box wrapped in layers of gift paper to try to keep it safe but keep the box within the size that could be posted. 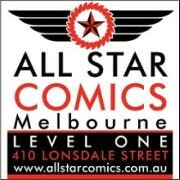 A stellar effort! As for the figure itself - it's one thing to know a toy is going to be big, and another to really appreciate it! He's a 19" figure that comes in a packaging that is the same as the regular MU figures, just proportionally bigger (read: huge!! - have a look in the Facebook album for photos and comparisons). On one level, I really regretted having to open him up, but this definitely isn't the kind of figure that you buy an extra of to keep one carded! This is a really fun thing to own, but it's also an amazing piece. The level of detail on Galactus' costume is just unbelievable. There's very intricate sculpting here, lots of edges and ridges. His headdress is amazing and suitably impressive in size. The only thing I'm not totally grabbed by here is how much of his face is covered by his mask. I'm used to seeing a bit more of his cheeks etc - the amount covered here makes his face look a little disproportionately small in relation to his head. Despite the size of the overall figure, articulation hasn't been compromised. Galactus balances well and can be put in quite a number of standing and action poses. All joints move freely but aren't loose, making it easy for him to hold poses like grasping a smaller figure, etc. I haven't put in batteries yet to try the light up features. AFB and family are moving in December and I'll probably wait until that is done. It looks like I need to move his shoulder harness to put them in. It'll be fun, but not what I bought him for so I'm happy to be patient. The only shame here is that at the moment I've had to put Galactus on a shelf with larger statues as I don't have the space to put my Marvel Universe figures with him. I guess that means that once we relocate I need a bit more display space, right? Bring it on, and some similarly scaled MU figures to complement the assortment certainly wouldn't go astray either! You can see more pics at Facebook, discuss this at the AFB Forum, and comment on this post to enter the October AFB Comment of the Month Contest - with an extra chance this month for an AFB Facebook fan! Oh man you opened the massive card he comes on. Hopefully they aren't impossible to find in stores a month from now as I can't spend that amount on one right now. He looks so nice, though I kinda miss the metallic paint of the Marvel: Legends one. MU Galactus is an awesome figure, and I don't regret spending $50 on him. Glad you're able to appreciate his awesomeness. Very nice Andy, my jealousy knows no bounds. Just of curiousity, how much was the shipping to Oz? I've been tinkering around with getting one myself, and wouldn't mind having some kind of comparison price for it. Nice! 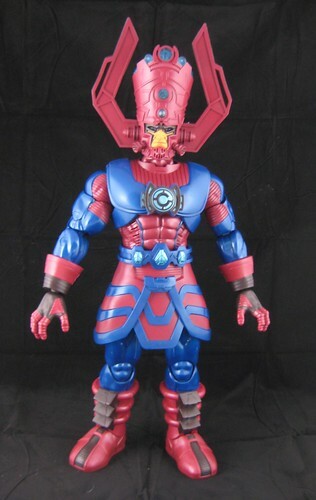 I just scored a 14" Galactus by Toybiz from the 90's on E-Bay that lights up/talks... I can't wait to get him! You definitely need to add batteries to experience the wonder that is Galactus. He has some wonderful phrases that almost rival my sleepy-time Spider-man plushie. I couldn't - and still can't - get over just how freaking huge the toy is. Pictures don't do it justice! That is awesome, I am jealous. My wife would probably leave me if I put up a figure that big. Saw one in person at a store out-of-town and it is indeed impressive. They had him marked up to $100! Glad I got to scope him out, though. Not sure where I could display him right now. May try to rearrange some things today since I got some of those white plastic spice adjustable racks dirt cheap at a garage sale. I don't see where I can put all of them, though. Yup, he's definitely a winner! every time i see Galactus. i am amazed that Hasbro pulled him off for the mu line. almost makes me want to get one if i did not have Galactus already.